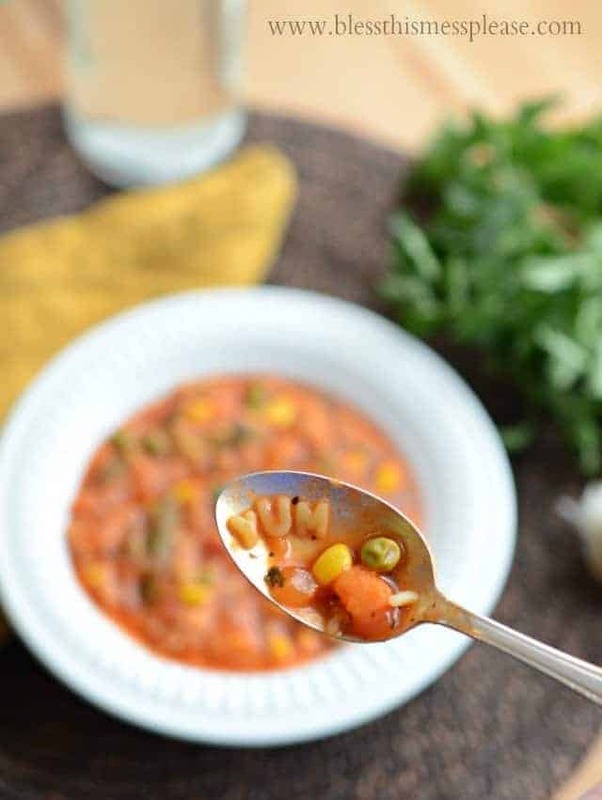 Alphabet soup that is super easy to make, packed with vegetables, kid-approved, and done in 30 minutes or less. 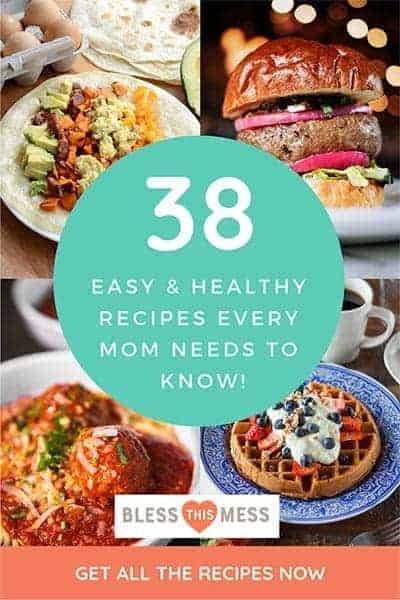 Choosing healthy options for your family doesn’t have to be time consuming or expensive, and today’s recipe proves that point. 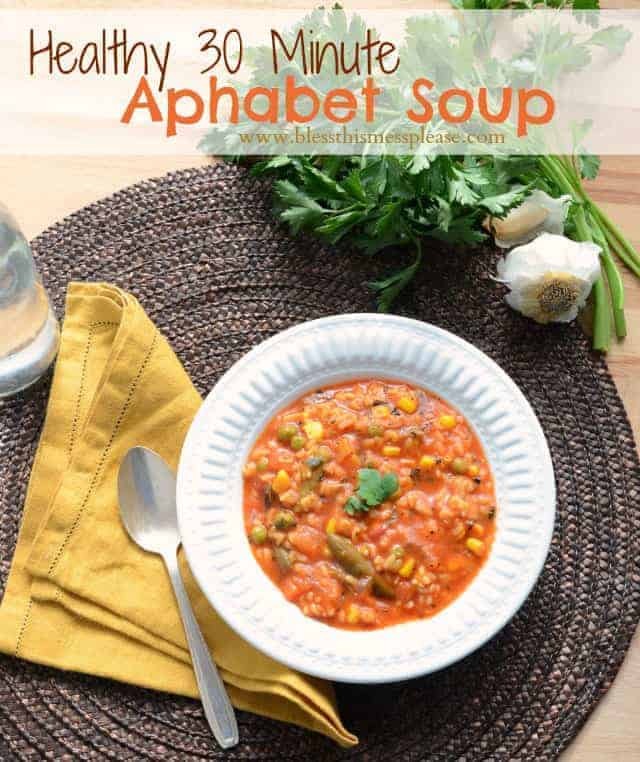 You are going to love this healthy 30 minute alphabet soup. It’s kid tested and healthy mama approved. If putting a healthy meal on the table is quick and easy then you have no reason not to! This past summer I grew a huge garden and canned my heart out. My pantry is plum full of delicious veggies that I pull out now, in the middle of winter, and enjoy. I know that most of you weren’t able to do the same, so I made a recipe using lots and lots of canned veggies that you can pick up at the grocery store! 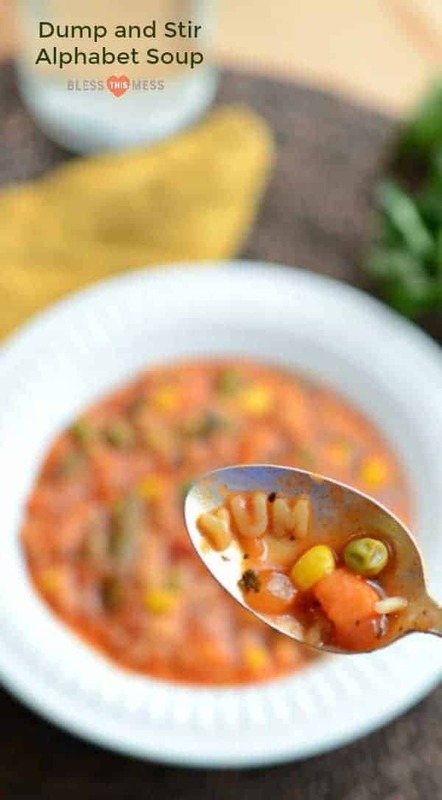 There is something magical about alphabet soup. Having all those fun letters hiding in it makes it so easy to dig in to. 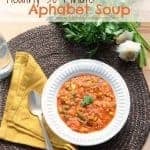 My little ones love finding the letters to their names and if they happen to eat tons of vegetables while doing so I’m not going to complain. This soup is thick and hearty without being heavy. 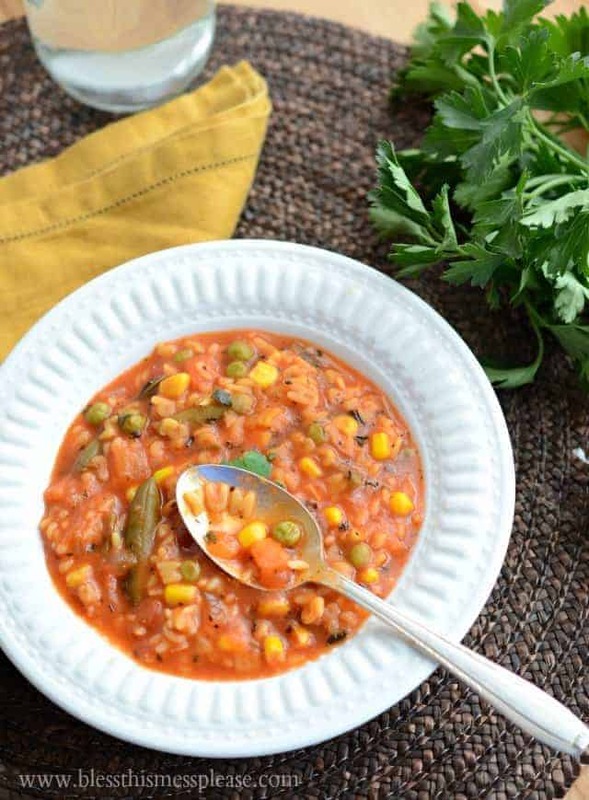 With just the right amount of seasoning and a magical sweetness that comes from the use of ripe tomatoes in the tomato juice, this soup is going to please even the pickiest eaters. This soup is pretty thick, just the way I like it. If you’d like it less thick add a second can of water and adjust the seasoning to taste. You can find the alphabet letters near other pasta or in the Hispanic foods section of the grocery store. This is a great dinner to add some Super Simple No-Knead Bread or some Quick and Easy Sweet Potato Biscuits both are great options that my kids love. Don’t like green beans? Don’t add them! This is the kind of soup that you can add or take away what you do and don’t like really easily. Make it your own. In a large pot, heat the olive oil and onion over medium-high heat until the onion is cooked through and translucent, about 5 minutes. Add the garlic, tomato juice, diced tomatoes (with the juice), green beans, peas and carrots, corn, water, bullion base, parsley, basil, and salt to the pan. Continue to heat until the mixture is boiling. Add the alphabet noodles and continue to cook while the mixture is boiling for 10 minutes. Stir frequently. Remove the pot from the heat and allow the soup to rest for 5 minutes. Add salt and pepper to taste (don’t be stingy on the salt!) and enjoy right away. Y-U-M is right! Wasn’t that easy?! Open a few cans, let the pasta cook, and enjoy. Done. 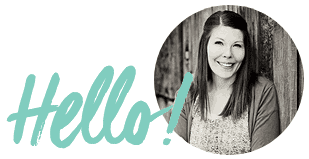 This is one of our favorites and I can’t wait for you to make it too! Enjoy from my kitchen to yours. I’ve never seen alphabet noodles. I’ll have to go hunting! We stock up on green beans, corn, pears and peaches. I wish I could grow a garden-ful like you. Some day! Do canned beans count? Because I always have those. But veggies I always, always have diced tomatoes, green beans and corn. I have corn, green beans, and tomatoes in my pantry. I keep canned green beans and peaches stocked in my pantry. Canned apples! Who knew you could do it and it would work?! I tried it this fall, and now I have a bunch of canned apples that I pull out, whip up a pie crust, and throw into the crust. FAN to the TASTIC. Love it. Beats freezing and then storing them in my still valuable freezer space. I DO NOT buy anything but De Monte. I have my lazy susan and pantry stocked with green beans and corn. I try to stock up on them when they are on sale. I love to open a can of corn heat it up add butter and have it for lunch. I also make green bean casserole for the family which is their favorite. Del Monte is the best buy far and taste like fresh picked veggies. Keep up the good work Del Monte you are the best. I’m trying this tomorrow! Thanks! Green beans and corn for me!! pineapple and mixed fruit in my kitchen cabinet. I like to stock up on canned fruit like fruit cocktail or pineapple chunks. My favorite fruits and vegetables to stock in my pantry are canned tomatoes, peas, corn, green beans and peaches. I like to stock up on potatoes and green beans. we love corn peas, pineapple and pears. I keep tomatoes, corn and peas stocked. I usually stock tomatoes, peaches, pears, corn. Canned winter squash is a family favorite of ours for the pantry; also canned black beans for a quick addition to any meal. Oh my gosh this looks so yummy!!! And you’re “yum” picture is darling. We always have canned tomatoes on hand. One of the only veggies we use canned. But maybe I’m gonna have to use Del Monte and give canned ones another go! I like to have canned tomato products on hand–and mandarin oranges. I just tried canned hominy for the first time and kind of liked it too. Thanks! My favorite fruits and vegetables to stock in my pantry are cauliflower and cantelope. Thanks for the giveaway! canned green beans cuz the kids love shepard’s pie & that’s how I make it. I like to stock apples year round. I like to stock up on corn and tomatoes. Peaches for peach cobblers and green beans for green bean casseroles. Tomatoes, peaches, corn, green beans, pineapple – I use them all. I always have a variety of beans, plus some form of canned tomatoes, and usually corn and peaches. 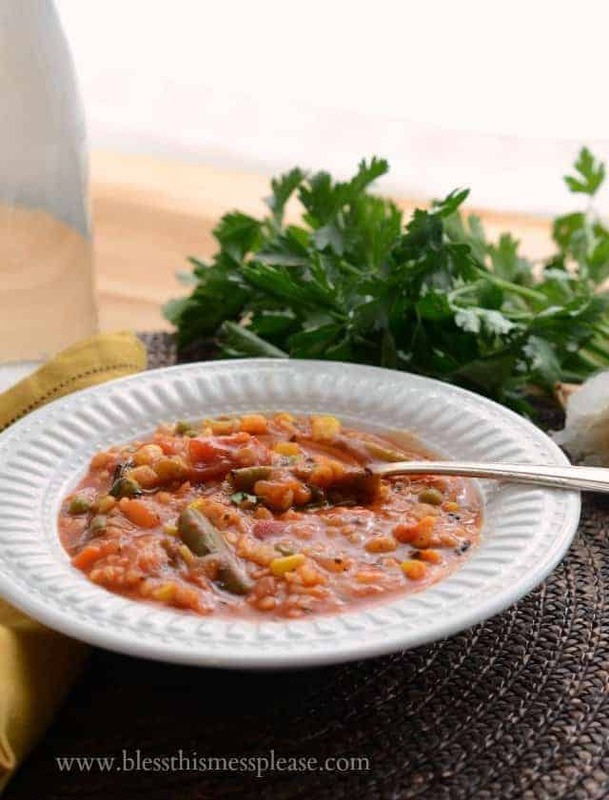 My most-stocked item is diced and stewed tomatoes because I use them so often in cooking! I love having artichokes on hand. It’s so handy! I have to have tomatoes with green chilies, mushrooms and pears in our pantry. Tomatoes…paste diced ,puree, every different way. I always keep a good stock of green chiles and black beans! We always have a variety of tomatoes on hand (diced, stewed, whole-peeled, etc. ), corn, and pineapple. I like green beans, peas, and apricots. I always have canned corn in my pantry. I usually have tomatoes, canned potatoes and sauerkraut. I like to keep lots of corn and green beans since they are so versatile. And we love manderin oranges and pineapple too! I always have pineapple and green beans stocked up! I always have olives, mushrooms, and green beans in my pantry. I always stock green beans. I stock corn (my personal favorite), green beans, several different kinds of tomatoes, peaches, pears, mandarin orange. In fact, I probably have at least one of every item Del Monte offers. We have a lot of favorites. We keep bananas and tomatoes in stock all the time. Along with potatoes. I like to keep strawberries stocked. My favorite vegetable to keep stocked in the pantry is probably canned peas. pineapple is great to keep in my pantry because it makes my recipes so tasty & it tastes great right out of the can! I like to stock up on green beans and corn. I love to keep lots of different beans and tomato products on hand so that I can always throw together an Italian recipe or pot of soup. My favorite to keep stocked up on are all kinds of beans. I like to have tomatoes and pineapple on hand. Never been a fan of peas, but corn is an absolute must! Whether it’s a side, in soup, or with nachos(don’t knock it until you try it!) I always have corn on hand. I always have green beans and peaches stocked. I keep my pantry stocked with Del Monte; peas and carrots, diced AND stewed tomatoes. My son eats most anything served over pasta so Del Monte makes up 85% of this skillet full of tasty, nutritious dinner – and leftovers for my work lunch box. Brown a cut up head of garlic in butter OR bacon grease if your lucky enough to have some around. Add a chopped onion to the partially browned garlic. Add I sliced up link of your favorite sausage or 1/2 lb of browned turkey burger when onions are half way done (they continue cooking while the sausage is cooking / releasing its flavor into the mix). 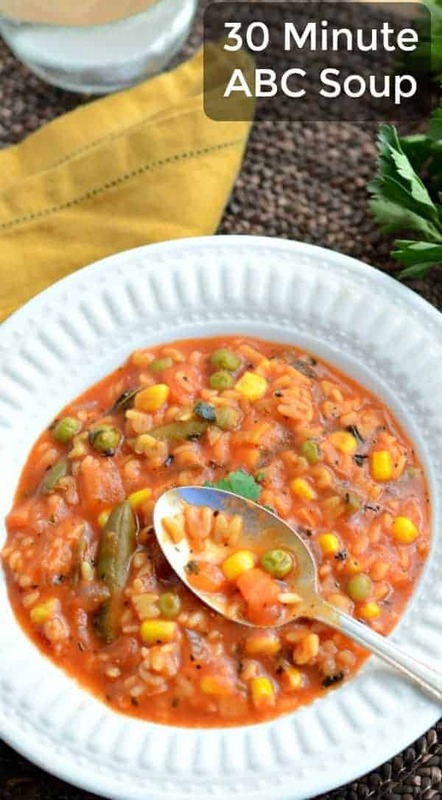 Add a can of peas and carrots, one or two cans of diced or stewed tomatoes to heat up in last 5 min. of cooking, until sausage is done – plump and juicy ! I serve it over pasta with grated parmesan chesse and toasted sour dough ! A complete nutritionally balanced meal in one skillet ! i store left over pasta seperately and combine before reheating throughout the week from my lunch box. Enjoy !